When I'm not reading, I quilt. I'm not a football fan. In fact, sports in general simply bore me. But my sister is a rabid Steelers fan, so I made these for her birthday. I found the Steelers fabric in a bag of scraps which was a gift from one of my other sisters. They were oddly shaped pieces which is why I had to piece the front of the potholders with that black strip. I backed them with some heavy red fabric that was the wrong weight for quilting or doll clothes. And instead of batting, I used some Table Felt (a.k.a. Silence Cloth) which had been sitting around in my sewing room for years. I think it will be thick enough for functional potholders. Even if it's not, I doubt if that will be a problem. My sister was so pleased with my gift that she plans to use them as decorative objects so that they will "stay nice." Having the folded edge of the binding glued down makes it a lot easier to machine stitch the other side of the binding because it can't shift and is not distorted by pins. And this is important because I was planning to attach the folded edge of the binding by sewing a line of stitches right next to the binding, in the ditch so to speak, on the front of the potholder. I've found that if I use a thread color that matches the binding, the stitches blend in with the binding and do not really show up on the front of the quilt. On the back of the quilt, the stitches stay on the binding because the part that is folded to the back is wider than the part that is in front. In this second method, I liked the reinforcement of the corners, but when stitching down the binding from the front, my stitches sometimes wandered off the binding in the back. But hey, it's just a potholder. And that's a liberating thought considering how tense I sometimes get about my quilts. So on the whole I was pleased with my quickie project. I wish I had chosen a white or unbleached muslin for the backing so that the lines of quilting wouldn't show up so much. But as I said, it's just a potholder. About two months ago I hurt my right shoulder. I'm not sure how I did it, but I was feeling pain whenever I lifted my arm up or to the side. And despite physical therapy, it got worse before it got better. I couldn't drive for a couple of weeks, and I couldn't even use a fork with my right hand. 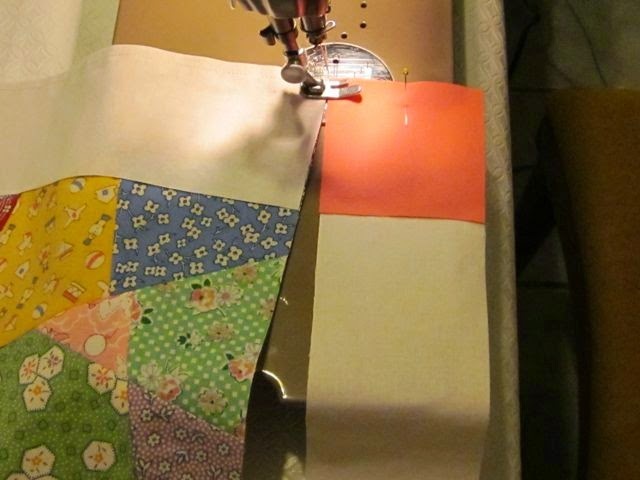 But the worst part was that I couldn't sew or quilt or wield my rotary cutter for what seemed like an eternity. This was especially frustrating because just before my injury I had started a new project which I was eager to work on. I'd been watching one of Bonnie Hunter's Quilt-Cam episodes wherein she was sewing Carolina Chain blocks. This pattern had appeared in her "Addicted to Scraps" column in the May/June 2010 issue of Quiltmaker Magazine.They looked like such fun that I just had to start cutting and sewing them. Bonnie's are made with 2 inch strips, but I decided to cut mine at 2.5" inches. So my basic unit finishes at 6 inches instead of 4.5 inches, and my finished blocks measure 12 inches. The basic unit is a modified Nine Patch. It's one of the easiest blocks I've ever sewn. No triangles or bias edges -- and only two spots where you're matching seams. Half are made with a dark background and half with a light background. When four of them are joined together, a pattern of light and dark chains emerges. 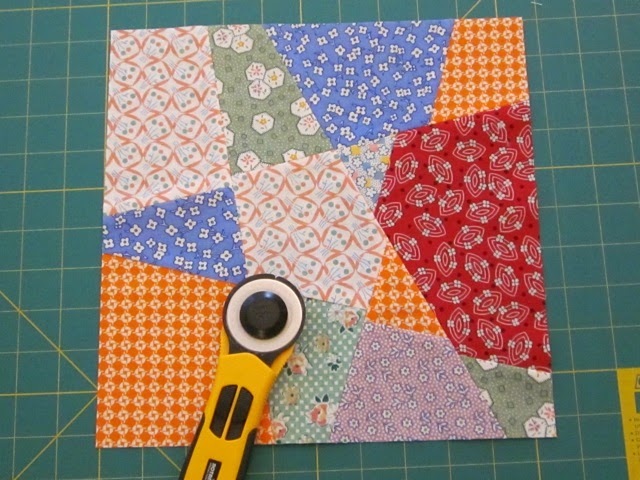 This pattern would make a striking two-color quilt, but I've decided to go for a totally scrappy look. However, I can see that I'm going to need lots more variety to really make it sing. Since this was a spur of the moment project, I'm planning to make it into another baby quilt. Because after two months of inactivity, I am really in the mood for a quick finish. 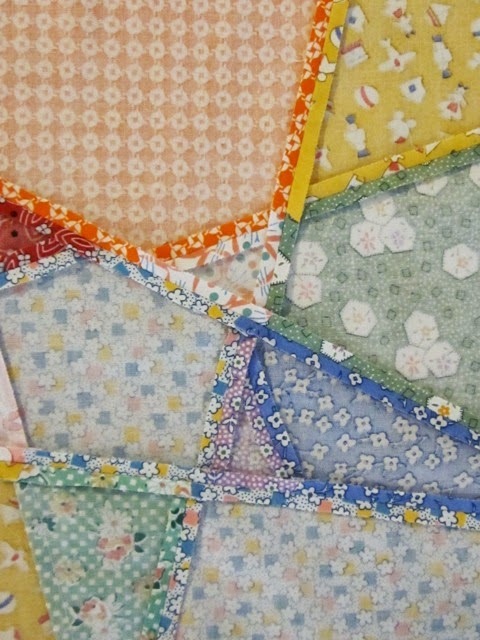 Today I'm linking to "Let's Make Baby Quilts" at Michelle's Romantic Tangle. Way back in January, Bonnie Hunter wrote about choosing a one-word mantra and making it your focus for the year. Her word was "Finish." I decided to adopt it as my word too. But although I've managed to make progress on many projects, none of them has actually reached completion except for a few tiny things like doll clothes. The obvious solution is to work on focus -- concentrating on one project until it's finished. Bonnie talked about the importance of focus on a Quilt Cam episode on Dec. 28, 2013, and I found it very inspiring. But this past week I realized that another solution is re-thinking the project. While rummaging through a drawer I found 10 of these crazy "slash & shuffle" blocks. I made them at least 15 years ago using some instructions I found online. I never made more than one batch because I just didn't enjoy the method. So I just shoved them in a drawer with the vague intention of making them into place mats someday. Only . . . I never use place mats. Last week it occurred to me that I could set them three by three with sashing and have a baby quilt. 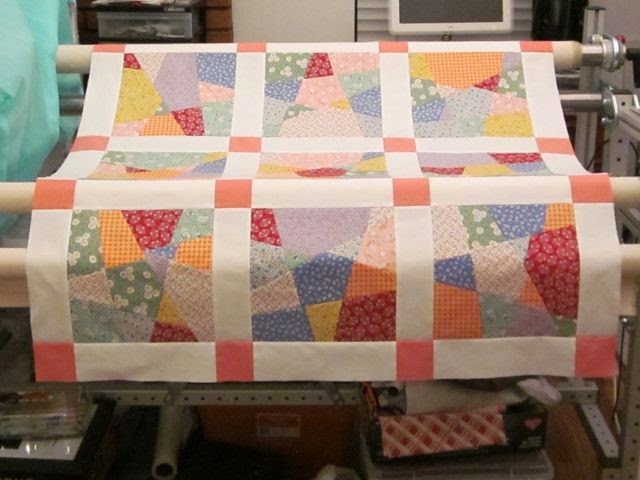 And then I'd have another quilt top on which I could practice my free-motion quilting. Ten inch squares, nice and neat! The fabrics are all '30s repro prints, so I chose white sashing and pink cornerstones. I used a sash-as-you-go method in order to stabilize the slightly bias edges. And I chain-pieced the blocks and sashings on my Singer 301. It seemed like the top was done in no time! And I realized that many UnFinished Objects might well be converted to baby quilts -- especially if the blocks are unloved or I've lost my enthusiasm for the project. I waited a day or two to see if I wanted to add a border. I think not. I've got a killer fabric for the binding, so I think this top is done. Time to make a backing and get it on the frame. The depressing thing about doing Stash Reports is that I'm such a slow quilter that I hardly ever get to record any fabric used. A lot of things are in progress, but the only one I've finished is a sun dress for my niece's doll which used up a mere quarter of a yard. Quite a lot of fabric came in this week, but they were all thrifty purchases. 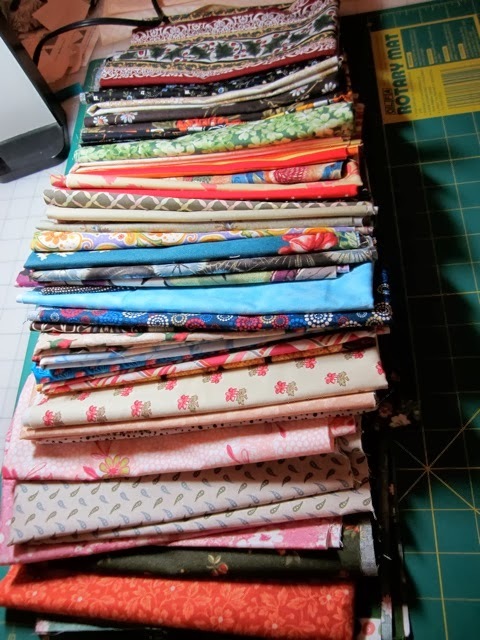 I bought the Ultimate Fat quarter Collection from Nancy's Notions: 42 fat quarters for $41.99. 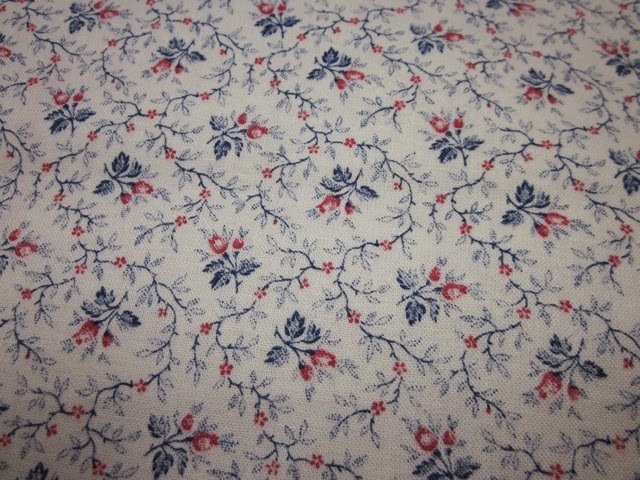 Although I love buying fabric grab bags, and it was a good price, I really hesitated when I placed the order. A customer had left a bad review of this item because she felt that most of the fabrics she received were dark gloomy colors. However, as a scrappy quilter, I thought it likely that most of the fabric would be useful. And I was not disappointed. At the thrift store I found 2 yards of this print for only $1.90. 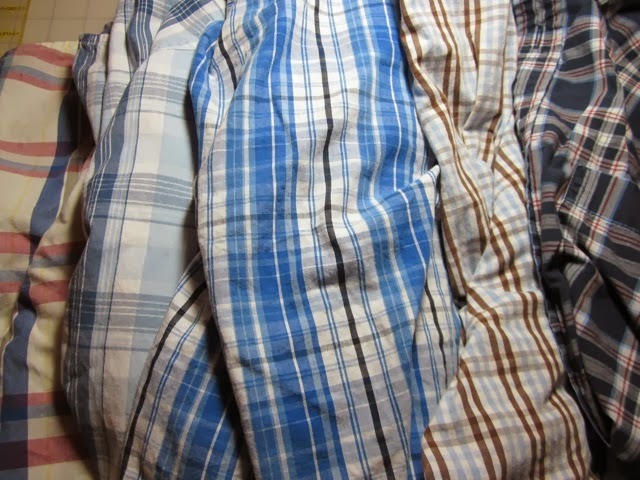 Then my brother gave me 6 large men's shirts. I'm not sure how you figure the yardage on these. I'm going to say 1/2 a yard per shirt since they have short sleeves. Today I'm linking to the Stash Reports at Patchwork Times. This is the last installment of 7 Posts in 7 Days. This week I joined Jennifer Fulweiler in writing seven posts in seven days. To check out other bloggers who were doing the same, see the list here. 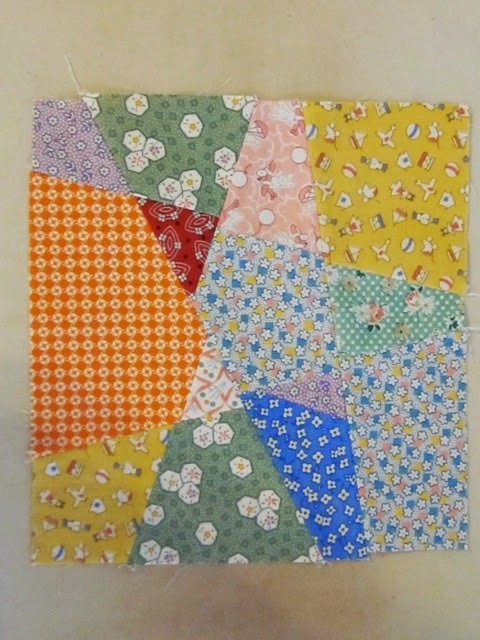 Many, many years ago, when I first started quilting, I made some crazy quilt blocks. I didn't know what I was doing, so I tore up an old sheet to make 13 inch squares to use as foundations. 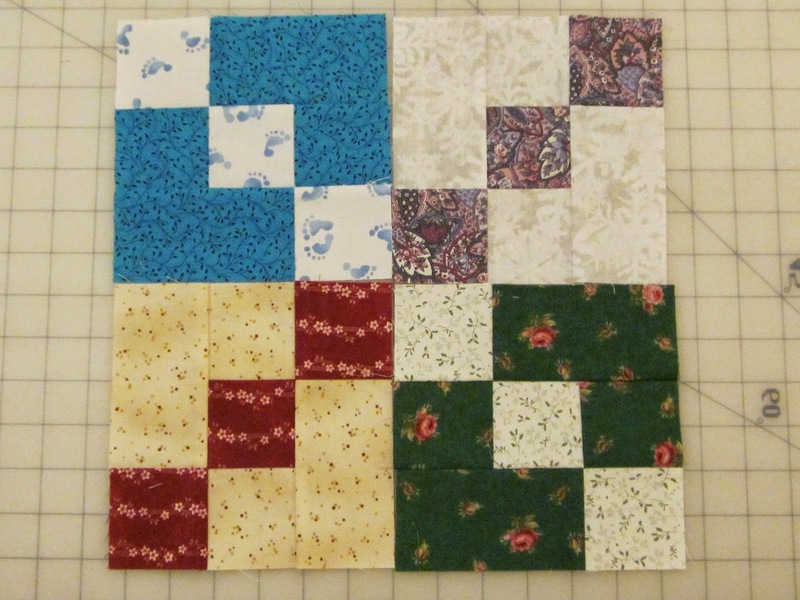 For my crazy blocks I used scraps of all kinds -- including polyester blends. I used the sew and flip method and decorated some of the seams with the fancy stitches on my sewing machine. And then the blocks sat on a shelf for decades. Recently, I pulled them out again, squared and trimmed them to 12.5 inches, and actually put them together to make a quilt top. It's not a very pretty quilt top, but at least it's done. I find myself looking at the different fabrics. Sometimes I recognize them. Here's a bit of my daughter's dress. And there's a bit of the printed panel from which I made a dinosaur toy for my son. When I look at some of the other fabrics I can't help wondering why in the world I ever bought them. I would never make this quilt now. At least, not in this way. 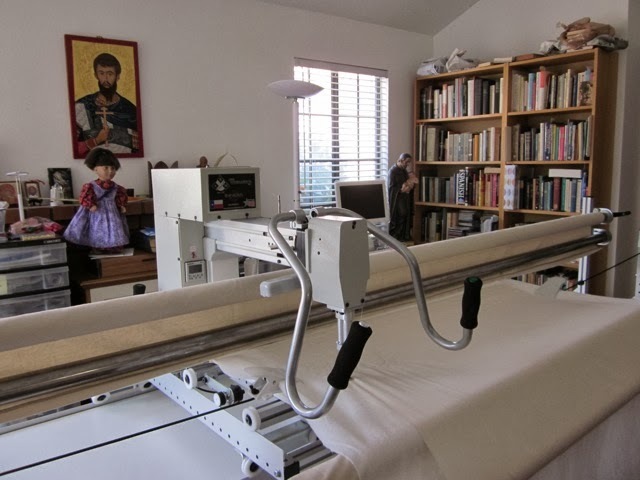 It's an Innova long arm quilting machine, and it fills my entire living room. (I don't really need a couch, right?) It took three years of shopping, researching, and testing various brands before I settled on this one. I love it! It's got an 18 inch throat and a 10 foot frame. I could do up to a queen sized quilt on it. (But so far I haven't done anything that large.) It's very well engineered, and it glides so smoothly that I can guide it with one hand if I want to. I don't have much upper body strength, and I also have osteoporosis in my spine, so I wanted something that I could move without struggling or strain. It's very versatile in that it can use almost any thread. And the manufacturer offers 24/7 technical support. It's also modestly priced compared to most long arms. I bought my machine from Let's Quilt in Utah. They were vendors at Road to California. (However, they are now cutting back on that sort of thing for heath reasons.) There's a lot of useful info on their website as well as some great videos about ruler work. And this is the link for Innova itself. I'm not connected to either the dealer or the manufacturer in any way; I'm just a really happy customer. The thing that everyone asks when they find out about my machine is, "Are you going to be doing this as a business?" And my answer is, "No. At least, not yet. And maybe never." But if I'm not planning to make money with it, how did I come to buy such an expensive machine? A couple years ago I decided to become serious about learning to machine quilt. I took some classes, read some books, and tried out various tools. I have problems with my right hand and elbow (which I injured in my youth). And I found that the motions used in quilting with my domestic sewing machine really stressed my body and made me more reluctant to quilt. Using a long arm machine just works better for me ergonomically. And of all the machines I've tried, the Innova is the easiest to use and does not stress my body. Having it has made me eager to finish up some of my long standing UFOs. And that's a good thing. Why, you ask? Well, some quilters like to say that she who dies with the most fabric wins. But I think that she who uses the most fabric is the real winner. When I die, I don't want to leave behind a hoard of unused fabric that my children will cart to the curb for the trash pickup. I want to leave behind a legacy of finished quilts, most of which will have already been delivered to their recipients. And if my kids get rid of any of the quilts still remaining in the house, I'll come back and haunt them! This week I'm joining Jennifer Fulweiler in writing seven posts in seven days. To check out other bloggers who are doing the same, see the list here. 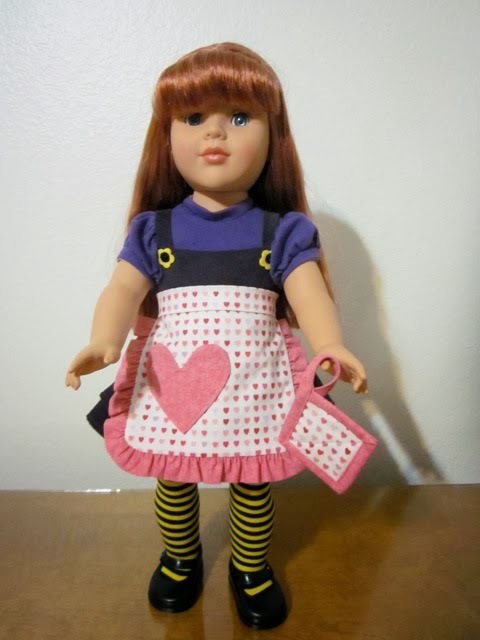 Here's a cute little apron and pot holder sized for an 18" doll. The Sweetheart Apron pattern was designed by Laura Johnson. It's fully lined, has a real pocket, and is very easy to sew. You can download a free copy of the pattern here. 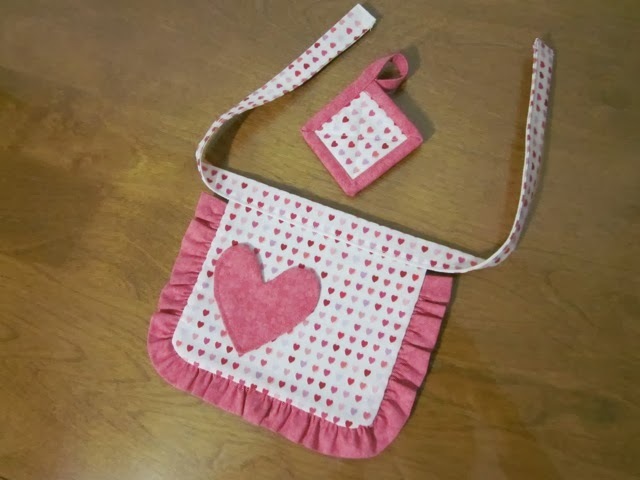 The tutorial for the potholder is at Pixiefair.com. The set is being modeled by Katie, a Madame Alexander doll which I found deeply discounted at Tuesday Morning. I bought her because I thought she would be nice for modeling strappy dresses, sleeveless dresses, or dresses with a low neckline. (Madame Alexander dolls have vinyl chests and shoulders, unlike American Girl dolls whose torsos are cloth from the neck down.) I'm a bit disappointed in her hair though. It's very fine and fragile, and looks as though it would not stand up to ordinary play. 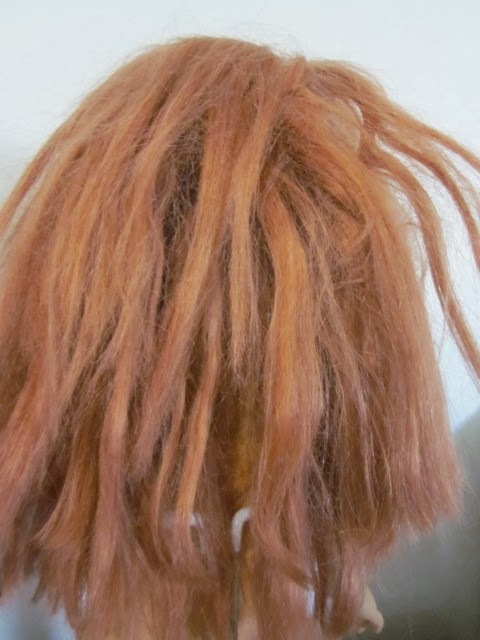 In fact, my hunch was recently confirmed; my little niece has this same doll, but her hair was in a dreadful state. She asked if I could fix her doll's hair and make her a dress (since she also was stark naked.) So first I bought some braid spray as recommended by American Girl Wiki, and wrapping her in a towel, I spritzed braid spray and water on her hair a section at a time. Then, using a doll brush with metal bristles, I slowly brushed her hair from the bottom up to take the tangles out. When it was finally smooth, I braided her hair into two pigtails in hopes of keeping it nice for a while. "Welcome to the doll spa!" "I'm having a very bad hair day." 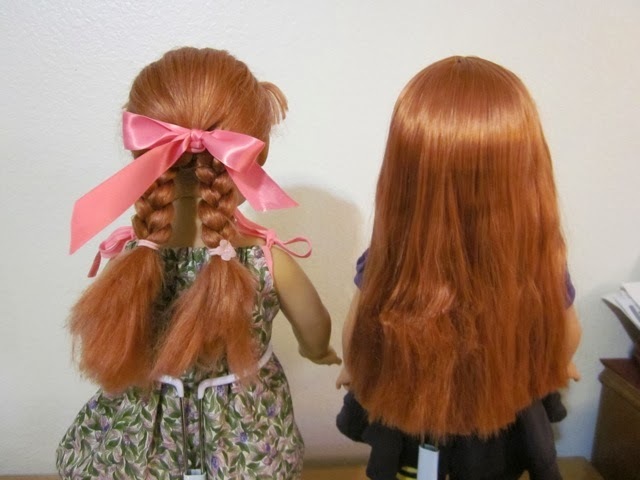 I was pleased with the way the braid spray helped me untangle the dolls hair. After it was dry, it felt the slightest bit sticky. I wonder if I should have washed the doll's hair first. Perhaps it was dirtier than I thought. I wiped the surface dirt from her limbs with a damp micro fiber cleaning cloth and then dressed her in a quickie sundress I made from a free pattern downloaded from Pixie Faire. I think it would have looked cuter if I had used self-fabric for the ties instead of bias tape. Her hair was cut or broken at several different lengths, so I couldn't make the braids as long as I would have liked. I had to trim her bangs because they had lost their original curl and were now too long. This was fun. I hope that someday I'll find a used American Girl at a thrift store or yard sale. 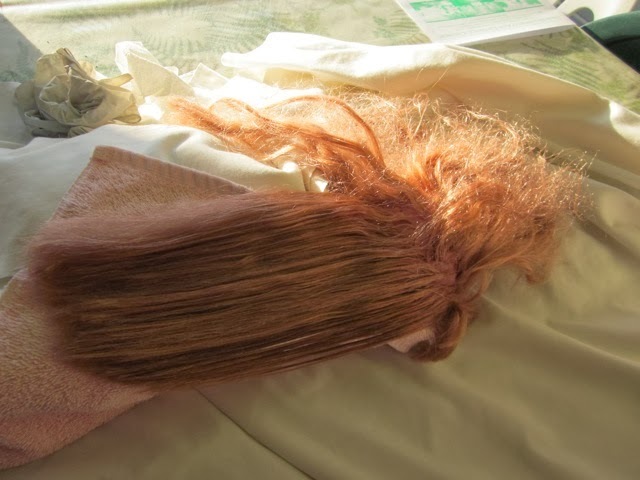 I'm really interested in learning how to refurbish dolls. 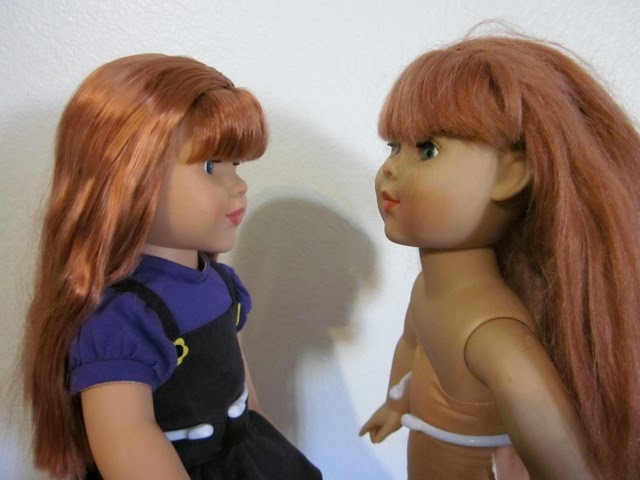 Update: I was so sleepy when I wrote this last night, that I forgot to mention that the person who originally had the idea of using braid spray on dolls is the author of the blog American Girl Outsider. Please see her post here. February is nearly over, so it seems a good time to take stock of Drop And Give Me Twenty 2014. The first half of the month was fantastic! Making a priority of quilting for at least 20 minutes per day made me feel great. 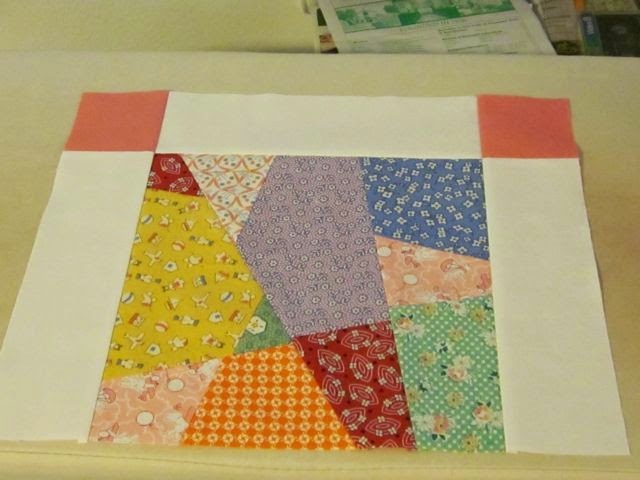 And since I often ended up quilting for more than 20 minutes, my baby quilt was progressing nicely. And then THINGS began to happen. LIFE began to intervene, a tax appointment needed to be prepared for, and all of my spare time began to revolve around an insidious new interest. Yes, dolls (specifically American Girl and other 18 inch dolls) were taking up more and more of my online time. I was reading doll reviews, doll blogs, and doll forums as I researched various brands of dolls, browsing eBay and the websites of various doll dealers. And well is it said that no man can serve two masters because there are only so many minutes in a day, and more and more of them were being sucked up by the Invasion of the Dolls. DAGMT has been a valuable exercise even though I "failed" the second half of the month. It's taught me that I'm happier when I regularly make time to be creative. And "7 Posts in 7 Days" is confirming the same thing, though in a different area. The one thing I think I have to be careful about is excessive Internet reading about my creative passions. As a quilter, I already know what a time sink the Internet can be. 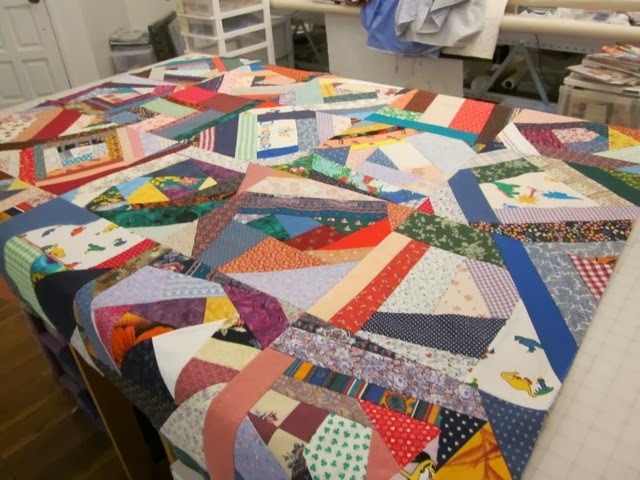 It's inspiring to be able to see amazing quilts online and to talk with other quilters. But too much of that results in too much dreaming and precious little sewing getting done. Ditto with articles about writing or blogs and forums about dolls. Well, Lent is coming up, and what better time is there to work on discipline and moderation. Who knows, perhaps I'll actually get the hang of Thursdays. Please buy notecards and other weird stuff from my son! Click on the image to buy "You Are My Sunshine" or other items in his Zazzle shop. n., a devourer of books. I'll read the back of the cereal box if nothing else is handy.